Saturday, September 15, Cash Mob Fullerton and Branding Personality held a Cash Mob at Carpe Diem Experience in Downtown Fullerton, California, in collaboration with the Chamber of Commerce in Fullerton. Cash Mobs were created to help local businesses get new customers, celebrate loyal customers, and generate money to help local economies. Once a business is chosen, the cash mob is advertised, usually through social media, email, and word of mouth. 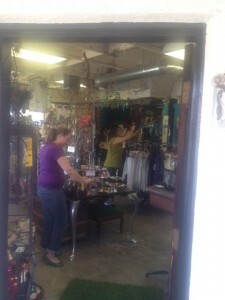 On the day of the cash mob, people show up and commit to purchasing $20 or more of products. Cash Mobs are a way for the community to come together, help a local business, and have fun and meet new people! Carpe Diem Experience in Downtown Fullerton is a unique art, clothing, jewelry, home décor, and bridal store. Artology at Carpe Diem hosts workshops where they encourage participants to escape from their daily routines and create personalized art. 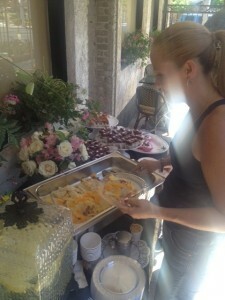 Carpe Diem also hosts private parties for groups celebrating birthdays, bridal showers, and friendship. On Saturday, local shoppers “mobbed” Carpe Diem. Shoppers experimented with jewelry, tried on resort wear, saw how fascinators are made, and participated in an Artology workshop. Mobbers got a preview of tasty treats from Le Creperie, a European pastry café set to open soon. 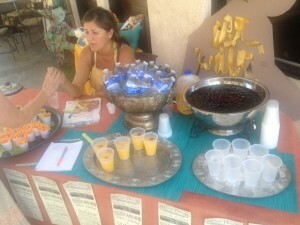 Owners of Le Creperie served lemon water, orange crepes, and an assortment of Romanian cakes. Cash Mobs help bring awareness about local businesses who may not have the means to buy large ad campaigns across different media. Through grassroots coordination, the ensuing social media campaign, and an enthusiastic Cash Mob, a local company can promote itself without having to spend large amounts of money. Cash Mobs have become a part of local communities all over the United States, encouraged by the commitment of organizers and participation of “mobbers” all over the country. Have you been part of a Cash Mob? How did you hear about it and what was your experience?